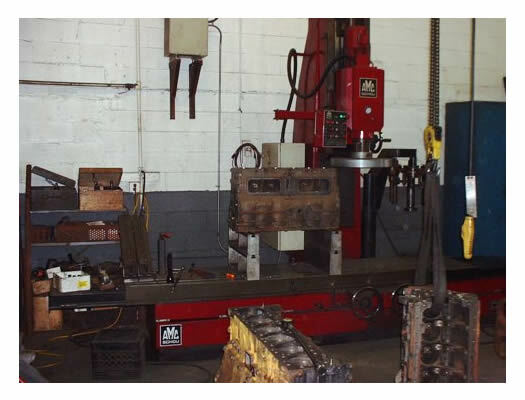 The Machine Shop has multiple work centers for all machining needs. Crankshafts - Magnafluxing, straightening, welding and grinding up to 118 inches in length. Rebuilding of industrial shafts. Balancing of crankshafts, fans and industrial shafts. Blocks - Four Boring Mills for boring and honing from 1.5 inches to 18.5 inches. installation of upper and lower repair sleeves, counterboring and machine decking. Alignboring up to 120 inches in length. Cylinder Heads - Installation of guides, seats and valve jobs from air cooled to the largest diesel and industrial engine. Pressure testing, welding and surface refinishing utilizing PCD, CBN and wet grinding methods. Rods - Resizing, Aligning and Pin Bushing replacement on most type of connecting rods. General Machining - Flycutting pistons. Rebuilding all types of axles and spindles. Removal of broken bolts and taps. Rebushing and rebuilding flywheels. Repair of overhead cam bores for automotive and diesel engines. Welding - Arc, mig and tig welding on cast iron and aluminum blocks and heads. Cleaning - Utilizing all methods incluting jet washers and soak tanks for aluminum and cast iron parts. Also oven cleaning and blasting for many components.